昔々 or むかしむかし essentially means “Once upon a time…” in Japanese literature. I’ve been reading fairy tales recently, since my Japanese is perhaps about the level of a very small child. This is the opening to おやゆびひめ or Thumbelina, and I thought it was a good fit for this shot. I came up with this picture for this month’s Japan Blog Matsuri–the theme is I Kanji, so I thought a self-portrait might work, though it’s not really the usual style of entries. It’s also my shot for this week’s Show Me Japan, which featured my shot from last week’s Prefectural Tournament! How cool is that? This entry was posted in Photos! and tagged arm, black and white, hiragana, kanji, me, self-portrait, tattoo. Bookmark the permalink. That is an AWESOME shot!!! Your arm? Thanks!! 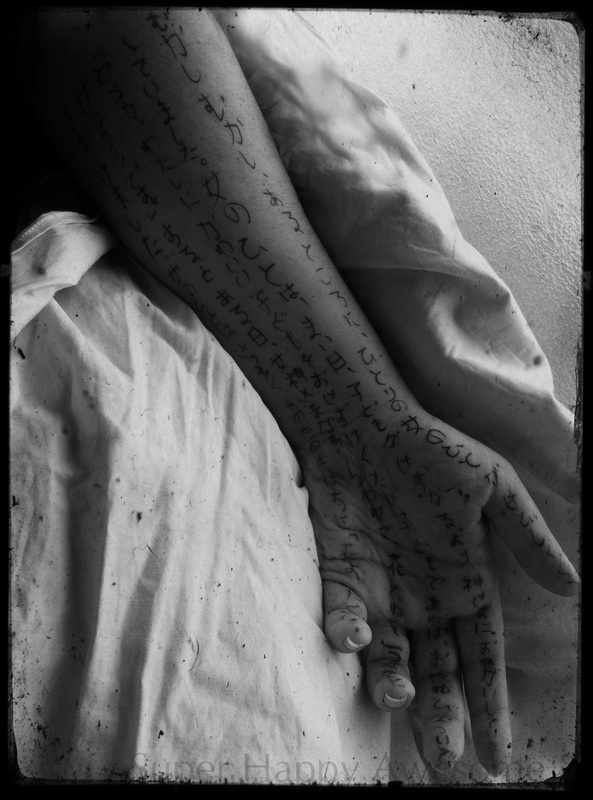 It is indeed my arm–writing on myself in that direction was surprisingly difficult, haha! That is so cooool! Your arm reminds me of another tale named “耳無し芳一” – Hoich the Earless! Very cool! One of my coworkers mentioned this story too, when I showed the picture to her. It’s so interesting, and gives me ideas for my next shot–thank you!! Did you write on your arm yourself? You didn’t get help from anyone? That takes some talent! Great shot. Thanks! Yeah, Sean doesn’t really write in Japanese, so it was all me. I was surprised at how difficult/bendy it was, haha!